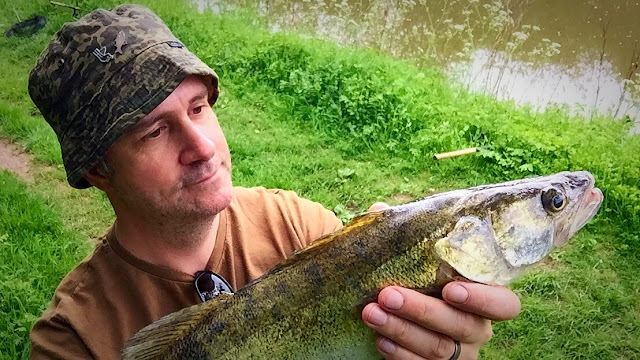 It was 12 sessions ago I hooked and landed a decent fish, a 9lb hard fighting cut Zander that reminded me just how I miss a proper pull on the rod, an ache of the arm, an activating drag. I use a 10ft 1.5TC Prologic MP Specialist Pro which is a super sensitive, but with a forgiving but slim blank, it’s light too, so great for roving for Perch or Chub for instance, and it gives such feedback even with relatively small fish the fight is enjoyable, but the fight of the 9lber was something else. Now my 2 rod deadbait onslaught hasn’t changed for a while and I’ve concentrated my efforts on a 3 mile stretch where I’ve now caught two canal Zander lumps, they have been 2 miles apart which is encouraging but there are so many holes in between I’ve not even laid a bait I’m sure there are some lurking monsters that are waiting to grace my hook. These scrappy schoolies give their best but I want my rod to be tested again…. It got me thinking about the new river season and the way I’m planning to tackle a new bit of river I’ll be fishing on the quest for a >5lb Chub, easily the biggest Monkey on my back and also a PB Barbel would be nice. I wouldn’t say I’m quite at the Joe Chattertons sleepless nights yet, but I’ve already been over thinking my approach come the new season. So with a few remaining sessions left before I hit running water again it’s these uncharted areas I’m planning to explore. With it being light till late another change is to fish of an evening, the canal seems to alter its character on this stretch, an eerie silence with a still surface usually covered in plant and forna and it’s quite pleasant to the eye seeing a float move with a Zander tethered underneath disturbing the surface crud, a lure rod would be out of the question. This session was the first on the countdown, time is running out on my quest for a cut double…. 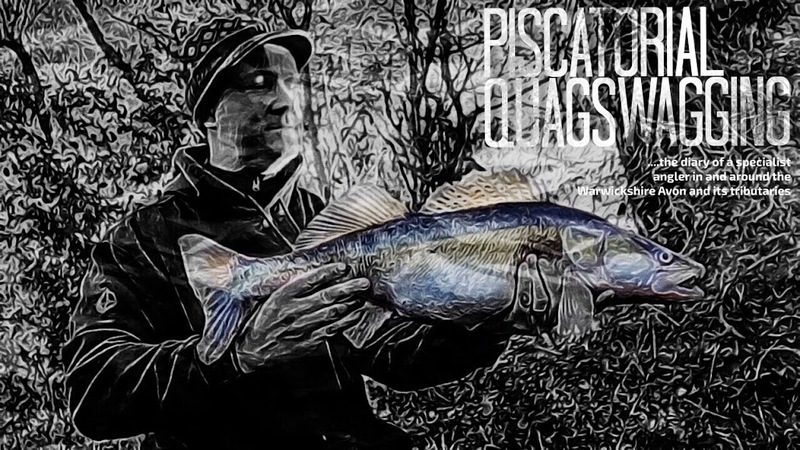 Another blank session, all very odd too as after 2 hours in 3 different swims without a bite I walked nearly mile or so to the banker swim where you can guarantee a zander in Jeff Hatt's X marks the spot fashion but again, not a jot. They were properly off the feed they really were as blanks up till now have been few and far between. Weird, I hear some repetitive beats, 120bpm if I’m not mistaken. As a white label producer in my youth that’s clearly the square and saw wave tones of a Roland TB-303, the tones sculpted with the 24 dB low-pass filter. short skirts and white stockings……. I wake bolt upright, my arms and legs swinging in opposite directions, the Wife doing well to avoid the commotion. Another memorable dream, Paxton and Whitfield’s finest Stilton kicking in again and given me another tryptamine trip. I’ve since bought a job lot….try some. So this Sunday morning session I’d come armed with a couple of Bream, I has some in my bait freezer that were initially for Pike Tyson that I hooked in to down the Avon. First thing I noticed was how much more blood came from the ½ inch sections, ideal as was the skin which is as tough as old boots. I wanted to fish a stretch of thick cover I’ve never fish before after nearly 2 hours without a bite and 1/2 an hour biteless in a turning bay, I had to make a move. The next section of cover I’d spotted some carp in the past so with the cocoons donned and the sun bright whilst waiting for a bite I could watch and listen for a mooching carp. It didn’t take too long to spot the first carp either, not the biggest but may help me in the future if I’m to partake in a carp quest. The quest for a cut 20, or along those lines. Just need that double figure Zander…. 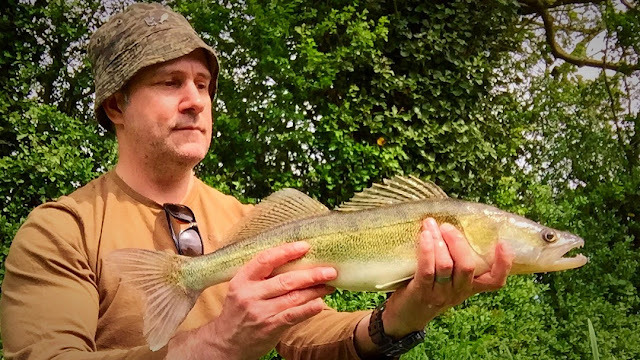 So the first Zander bite took an hour but then a pack of schoolies must of moved in because the floats didn’t stop, both at the same time too on a couple of occasions. Not what I was after but at least it wasn’t a blank. So 7 or 8 fish within 40 minutes or so, biggest nudging 3.5lb. Rewards come with hard work, with blanks, with bank time…. I had a short afternoon session at the Tefal Head, I had my usual 2 float set-up but also came to do some double dipping. The larger Zander have been absent of late so I also rigged up a carp floater set-up using my one piece 6ft 2.5TC Wychwood Extricator. It was fitted with a Fox Exocet controller float and the plan was to try and nab one of those carp that have frustrated me over the past few sessions leading to two lost fish. I like this set-up because you don’t really have to strike, the weighted float giving a bolt rig effect. I’d bought some oily trout floaters to try instead of the chum, not only were they larger and more visible in the turgid water but a quick try in a glass of water, they give off a nice slick of oil and flavour too, they are definitely more pungent than the standard mixer. If I think about the decent stamp of Zander I’ve been catching recently they all have been caught when it’s been relatively cold, maybe they are more active when it’s warm and therefore harder to pin down so a bait dropped on their head when it’s cold they’ve no choice but to take it. Weirdly the first fish caught was a Perch of around a 1lb, now considering the amount of time I've spent with dead baits on the canal this was the first one I'd caught, I've not caught a Pike either such is the clarity of water I fish. 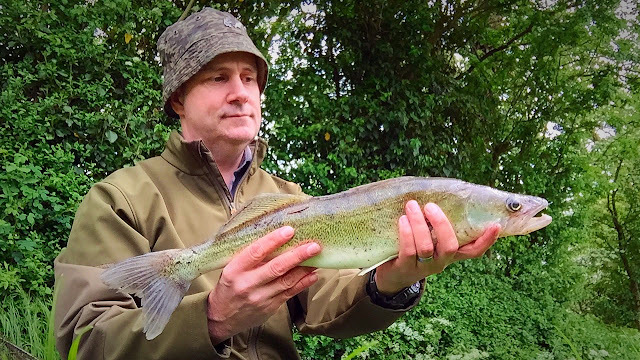 The boat frequency was starting to pee me off but despite the swim carnage I was still getting runs, within a couple of hours I'd had around 7 or 8 Zander the biggest nudging 3.5lb I'd say. For those initial hours I'd not spotted a carp but then with half hour gone without I boat passing through I walked upstream and spotted a few tucked away in the thick cover but they were gradually showing themselves and enjoying the sun. Not big fish but would give a decent bend in the rod. The float drifted down and wedged itself against an overhanging branched and within no time the carp were taking interest, a few nudges on the float, one even seem to take it in whole and spit it out. Weirdly the rod tip didn't even tremble, it was only when I adjusted its position that I realised as the mixers drifted down the line must have got caught and the bait was actually out of the water. Now it's only when I look to my left I realise there is a boat coming and it's nearing my swim, I'd no option but to give it one last tug and break the line. It's a strong set-up so suprisingly took longer than expect. In the mean time the skipper of the boat obviously hadn't seen my floats out and the rods backside so it's powering towards my swim. I've legged it back the short distance but by this time the first line has been picked up and the rods is receiving a workout like it's never had before. A few exchanges of words and now the next line is being picked up, again the second rod is going canalward. So with 3 rods needing to be re-rigged and the boat frequency off putting I called it a day. Fourth time lucky maybe, but I've decided to concentrate my efforts before the new River season on the species I've grown to love. It's now full on Zander. I don’t know why I’m worried about the recent humdrum, after fishing for Zander on canals many a time, big ones are hard to come by, its luck to stumble on one, nothing more. Obviously you’re going to help with the probability with time spent with bait in the water, a bit like where trying for a baby, forget the ovulation calculator, the healthy eating, the alcohol avoidance…. ….you need to carpet bomb. So for this pleasant short evening session I wanted to try a stretch of cover I’d never fished before, I’d passed it a few times but for some reason never decided to wet a line. I decided to bring some dog biscuits too to see if there were carp milling around as I’m thinking that I quite fancy a canal carp challenge to catch a 20 lber. Having stumbled upon a section recently where there are carp in numbers you never know where they could crop up. With the recent sunny weather there is no better time to spot them. The first fish came quickly, more or less on the drop, it was only 3.5lb or so but gave a good account for itself. I’m sure the warmer water is helping because everyone I’ve caught recently have fought harder than when I initially started the challenge. The little ones have become more aggressive too, jaw snapping at every opportunity. No denying their predator credentials. Anyway over 3 hours I had 10 Zander or so, the biggest was the first fish caught, the rest were around 1.5 to 2lb. With the Shanghai Anglers Club afternoon match off due to dwindling numbers I was back at the Tefal Head for another short Zander session. The fish have been a little off the feed of late, very up and down and patchy since I started the quest for a cut double. Over the last couple of weeks, its been definitely on a downer. With the temperatures relatively settled for a few days I was hoping that would change and they would be tempted by one of my roach heads. 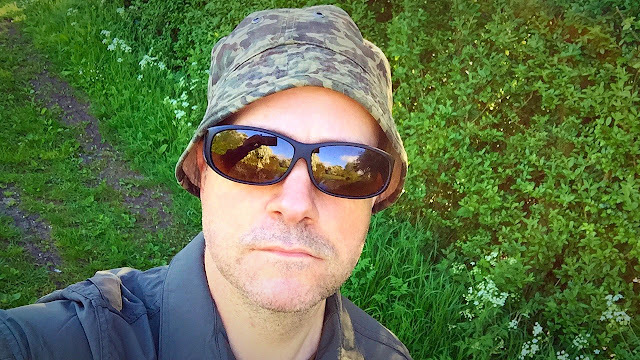 I’ve walked miles of towpath now and it’s becoming to feel second nature, considering the different areas I’ve fished on three different canals, other anglers have been few and far between. Hmmmm, hang on a minute, what's this, the first angler I’ve seen on this stretch since I started fishing it. He’s a typical tip tapper but the looks of it. Small lures, down the edge, utter concentration. Rod like a pencil, delirium tremens. Tip Tap, Tip Tap, Tip Tap Toe…. Embroidered polo shirt, cap to match. “How you doing, caught much ? He’s giving my rods the once over…. I move down the stretch, baits positioned and within a few minutes have my first run, I strike too early, the dead bait pops out the fishes mouth, rod back out, sure enough, on the move again. I strike, and a fish is on. The fish surfaces and make a splash, the rods visibly bent double. The tip tapper, now with a look of disbelief, comes over for a look. Well I wasn’t, it was small but you get the picture…. Anyway, we decided to part company. The more I think about the way my fishing for canal Zander has changed the more I miss fishing with lures or jigs. I’m a very mediocre lure fisherman to be honest with limited success, plenty of small fish but hardly anything of note, a 5lber my best over the few years I’ve been fishing for them. There is something nice about the feel of the bang through the braid, through to the carbon and the sound of the braid on the small reel against the eyes of the dainty rod that a float set-up cannot replicate. I do miss it, I really do. Anyway back to the fishing, there are carp here,in numbers too and over a couple of hours I must have spotted 6 or 7 different fish. Not the biggest, but each and everyone was seeking food. Enough for me to give the Zander a miss for a while, probably not but it's been noted in my head, if I want to fish for a canal carp, this stretch is worth a try. I must have caught ten to twelve Zander over the short session but sadly nothing of size, the biggest only went 3.5lb ,welcome all the same but not what I'm after. I'm fast becoming schoolied out. There is an eerie silence here, the odd tweet from a bird, a colonic calliope from a sheep, a squeaking cuniculus. The stretch is nicely located well away from the hoi polloi, the tall bordering trees acting like an acoustic blanket. It would be unsettling come dusk, luckily being a manky canal the Zander don’t worry too much, being coloured they feed at any time of the day. On the most part this short section sees little foot traffic, the boats more so, but it’s the relative sanctuary and the fact they are left relatively disturbed that I’m sure makes the larger Zander feel more secure. There is plenty of cover here you see so they can tuck themselves away, the carp too, seemingly enjoying the same safe house. Other fisherman? I’ve not bumped in to one yet. Why not I wonder, as I settle in to the rhythm of the first underarm cast, my body relaxes, my mind clears. It is the medicine of the uncharted, the smell of wild flowers and blossom, the clean air, the sounds of the natural world that clears the mind of one’s worldly cares. I anticipate the take, the float dips, I feel the tension in the line, sense the fish. A meditative state comes quickly for me when I’m fishing, I need that clear state of mind before I start to catch fish. Every man with a harried life like mine needs regular interludes of quiet and rest. Enough of the dribble I was back at the Tefal head, double dipping. A rod out for carp, one for Zander. A couple of hours, no more, the last in the swim where I’d caught Zander but also seen and lost a Big Canal mud filterer. The Zander came quick with a couple of schoolies banked within the first hour then up the stretch the trap was laid for the carp. It’s very elevated in this swim so I had to bring my large landing net handle that extends to 3 meters and also my large spoon net. A few floaters were left ignored and with ten minutes of the session left as the Wife had the dinner on I was getting ready to pack up…. Hang on a minute, a couple of liners, an active bobbin, sure enough a carp in the swim, it didn’t take long either, another few bleeps and all hell breaks loose. I had to bully it as the cover was thick, I stepped backwards on the towpath with the rod bent double, it felt a really good fish. I’d gained some line now and finally felt under control, time to get close to the water, get the landing net ready and see what I hooked. A huge boil on the surface, it’s off on a run again, the tip bouncing back and forth as it’s trying to lose the hook and get back to the thick cover. Some two handed side strain it’s now tiring. The nets now in the water, the fish surfacing with the boilie clearly visible in its mouth. It’s a good fish too but not the one I’ve spotted here before which was a golden common. This was a mirror, well over double figures. Landing net extended, the fish sees the net and tries a last gasp lunge, I reach out further to scoop the fish, it’s now laying on the rim. In the ensuing calamity the lines gone slack, the carp sees its opportunity, makes a last gasp powerful run and manages to break free from its tether. The landing net is now floating on the surface, I’ve rod in hand, did that really just happen. Yeap, another one of my angling disasters. Why did the spreader block fail like that ? as the frame or arms, yes but that was the thread that sheared far too easily in my opinion. Luckily for me it wasn’t the big common, now that would have really taken the biscuit. So as this canal carp lark isn’t going too well maybe the Angling Gods are trying to tell me something, I’m being sidetracked on my Quest, which is obviously not a good thing. So an extended session planned for Saturday morning, and I’m going back to the Laryngeal prominence , I’ve some new swims to try. The big carp was back in residence, its golden flanks clearly visible tucked amongst the far bank cover. It looks a cracker, long lean and wide across the back. Was this the one I lost last time ? maybe, who knows but with the Zander not really feeding of late it make a nice diversion from my single minded approach. Getting bored of Zander ? far from it as again for this session I was back treading the towpath on my quest for a cut double. You have to go early here, as soon as the first boat goes through, there tends to be a procession. Some narrowboats slow, some pass at full speed, and cause full swim carnage. 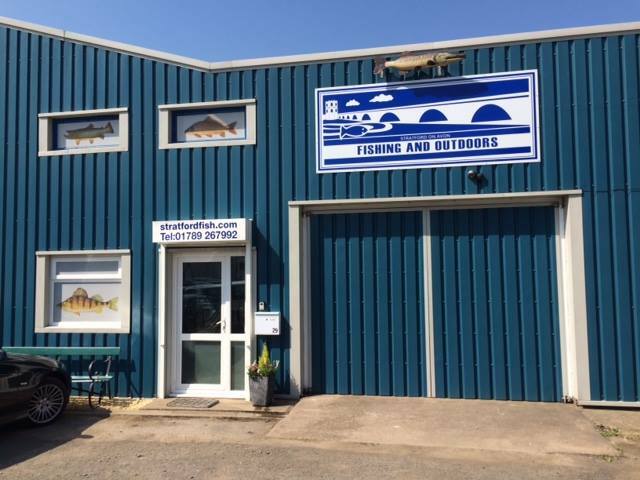 I'm sure some boaters think fisherman are in 'their' domain. It was another cold start and another tough session. I quickly nabbed a schoolie in the first swim but then I had to try 5 or 6 different swims to get interest from another. 5 or 6 followed, the biggest a nudge under 3lb, dark in colour and looked a little battle hardened. Short and sweet this one, I've Sunday dinner to get started and the wines open.